Glenn Greenwald’s book No Place to Hide, reviewed. Why Are You So Fearful, O Ye of Little Faith? 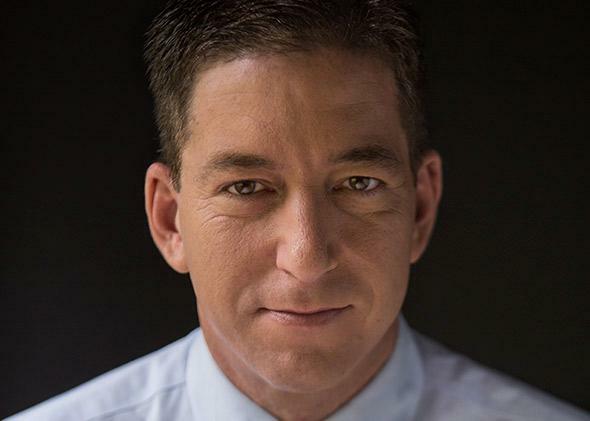 In his new book, Glenn Greenwald takes on the doubters. In the journalist Glenn Greenwald, Edward Snowden found a perfect match. I don’t mean to slight the contributions of Laura Poitras and Barton Gellman, the other two journalists who first dug into Snowden’s amazing and unprecedented trove of National Security Agency documents. Poitras was the one who realized Snowden was for real, and Gellman brought experience to the party. But Greenwald is the fighter—the one you want in your corner when the world comes after you. Snowden knew what he was in for, and he chose his cornerman well. Greenwald’s pugilistic skills are on full display in his new book, No Place to Hide. My copy came with CONFIDENTIAL stamped on every page and a nondisclosure agreement that expires today. The prepublication insistence on secrecy seemed a little self-conscious given the topic. And in the end, it wasn’t newsy revelations that kept me reading. Greenwald provides great new details on his most dramatic recent story, including the growth in collection of all kinds of Internet data from major tech companies (up “32 percent in FY12”). But the Snowden leak has of course already produced blockbusters, from PRISM (for vacuuming up everything from search history to email content to live chats) to BOUNDLESS INFORMANT (for cataloging and mapping metadata from phone calls and emails) to whatever the acronym is for tapping Angela Merkel’s phone. Greenwald’s job in this book is to put the pieces together and tell the story of how it all came to light. And, most of all, to convince us to care. Of course, dutiful, loyal supporters of the president and his polices, good citizens who do nothing to attract negative attention from the powerful, have no reason to fear the surveillance state. This is the case in every society: those who pose no challenge are rarely targeted by oppressive measures, and from their perspective, they can then convince themselves that oppression does not really exist. But the true measure of a society’s freedom is how it treats its dissidents and other marginalized groups, not how it treats good loyalists. … We shouldn’t have to be faithful loyalists of the powerful to feel safe from state surveillance. Nor should the price of immunity be refraining from controversial or provocative dissent. We shouldn’t want a society where the message is conveyed that you will be left alone only if you mimic the accommodating behavior and conventional wisdom of a Washington establishment columnist. Most egregiously, Greenwald recounts the moment in which David Gregory asked him, on Meet the Press, why he shouldn’t “be charged with a crime” for having “aided and abetted Snowden.” Gregory came off like the NSA’s handmaiden, and just as dispiritingly, no one on the panel, Greenwald points out, made a peep in objection. Greenwald ably rose to his own defense, and after the show, many journalists backed him up, but that clip remains an embarrassment. At least the profession woke up in time to award the Guardian and the Washington Post this year’s Pulitzer for public service for breaking the NSA stories. Reading about all the disclosures again, woven together and in context, I couldn’t decide which was worse: the NSA’s massive, grim overreach, in the hands of Director Michael Hayden—or the complicity of almost every other entity involved, private as well as public. “PRISM is a team sport!” trumpeted one NSA memo. Too true: Other memos and slides show Google, Yahoo, Facebook, and Microsoft easing the way toward surveillance of their users. (Twitter was the exception in this case.) When the Guardian and the Washington Post broke that news, the tech companies tried to argue otherwise based on a technicality. But looking back, the documents “give the lie to Silicon Valley’s denials of cooperation,” as Greenwald writes. After the Snowden revelations, tech CEOs took to warning the government that the NSA had to back off lest they lose their international customer base. Congress held hearings and is still debating a bill that would directly limit NSA surveillance. A federal judge said the government had probably violated the Constitution. And President Obama called for cutting back on bulk phone data collection. PRISM is no longer a team sport. All of these shifts came thanks to transparency, which means thanks to Snowden. Because the Bush and Obama administrations aggressively went after any government official who disclosed classified information, only a no-holds-barred whistleblower could have blown the NSA’s cover. The internal pressure built, and when the leak finally sprung, it let loose a torrent. No Place to Hide doesn’t offer an in-depth portrait of the leaker. In Greenwald’s protective hands, Snowden is a two-dimensional hero, ever brave and calm, sleeping soundly every night even during the tense initial phase of collaboration a year ago, when Greenwald and Poitras flew to meet him in Hong Kong. If you want to get under Snowden’s skin, read the Vanity Fair profile of him. But if you want to get a handle on what was at stake when he downloaded the government’s most precious secrets onto a thumb drive, this book is your primer. Greenwald is a guide who doesn’t brook dissent. For example, from his perspective ringside, it’s “ludicrous” and “inane” to have imagined that Snowden would have given away secrets to the Chinese or the Russians in his bid for asylum. Surely skeptics will argue that Greenwald is too close to his source to be trusted, but I don’t think so. I think he is vouching for Snowden because he vetted him and he knows him. Last summer the journalist and the whistleblower took a huge and risky plunge together, along with Poitras and Gellman. Now Greenwald is coming up for air and, with this incisive, slashing book, reaping the benefits of being adventuresome, dogged—and, as far as the evidence shows, right. And yes, the movie deal, Greenwald says, is on the way. No Place to Hide: Edward Snowden, the NSA, and the U.S. Surveillance State by Glenn Greenwald. Metropolitan Books.